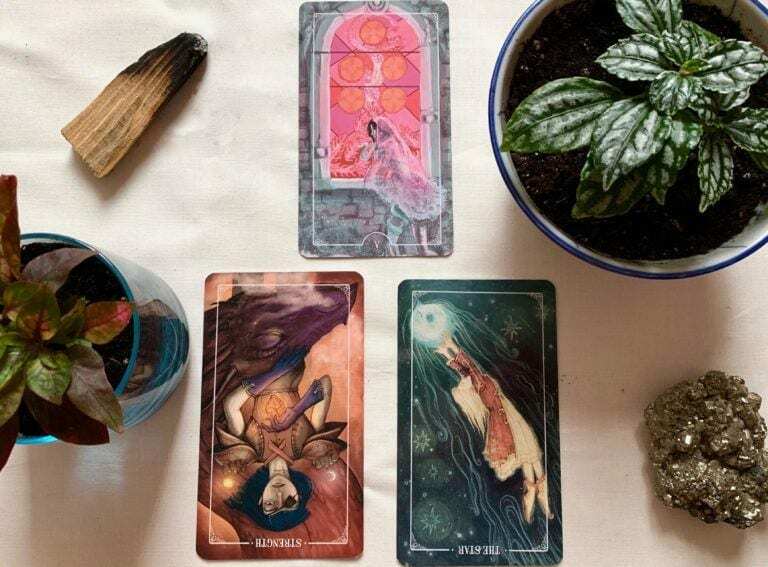 Wanderlust teacher Elizabeth Crisci shares a top-down pyramid spread tarot reading to help inspire, inform, and enlighten your practice this month. Spring has almost sprung! It’s getting easier to believe that the cold is actually over, and it’s time to clean house. In the astrological calendar, spring marks the beginning of the year. This season is associated with transformation, renewal, resurrection, and rebirth. These themes predate modern religion and related holidays; it is the Earth that was the first to offer this theme. Throughout human history, we’ve been continually revived by those first crocuses and green buds appearing on trees. This powerful time of transformation offers you an opportunity for serious growth in the direction of your choosing. As such, I asked the Tarot this month where should we look for support. In honor of spring I chose the gorgeous Ostara Tarot deck created by artists Molly Applejohn, Eden Cooke, Krista Gibbard, and Julia Iredale. This deck was designed to honor spring and the goddess Ostara, the Germanic goddess of the season. Ostara is associated with Neopaganism, though she was likely historically worshipped before then as well. Much evidence of pre-historical goddesses has been destroyed by conquering kingdoms throughout the centuries. I purchased this deck recently; I tend to charge a new deck before I use it for readings. For me, this means spending time meditating with the deck, shuffling, looking at the cards, and reading whatever materials are provided. It’s an opportunity to “break in” your new tool and form a two-way connection. This month I used a top-down pyramid spread with the first card representing our advice. The bottom left card symbolizes the unseen, unconscious energy present. The bottom right card is the conscious manifestation, where we feel the most supported. Creating a spread is an opportunity to be very specific with the Tarot and receive a clearer reading. For me, this really only works if I have assigned my intended meanings to the card placements before I pull the cards. My experience is that deciphering the meaning after the fact can lead to more “negotiating” with yourself over what you want the reading to say… Which can make it too easy to overlook the advice presented. The Ostara Tarot is a good example of a deck that is based on the Rider Waite but has taken many liberties. The artwork for each card does have rich and intentional symbolism, and for this reason the meanings of each card can deviate from the traditional meanings in some ways. My Grandmother insisted that you should use the meanings provided with each deck. I only partially agree, but in the case of this reading that’s what I’m doing. The Strength card here is reversed. Rather than a classical lion, we see a young woman with cities on her shoulders, night on the left, and day on the right. She is holding a glowing heart gently in one hand and stroking the head of a dragon in the other. Her expression is serene and she is wearing an eye patch. This wise woman has been through war and found her calm. She represents a balance of Yin, the Moon, night, feminity and Yang, the Sun, masculinity, daylight. Seeing this card reversed tells a different story. This is a warning and a question. When the world turns upside down do you keep your calm? Your own self-confidence is what supports your subconscious mind. Without it, your emotional self feels unsafe and you become weak. This is Tadasana practice. Forget any of the fancy tricks, learn how to stand on your own two feet. For the wise this is a lifelong practice. Without it the foundation of every other pose is cracked. The Star is also reversed—in this case representing boredom and the dulling of the creative mind. It is a suggestion to step outside of the mundane and monotonous routines you may have built. 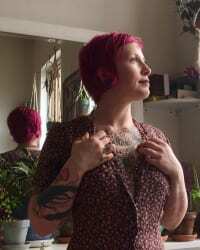 A cozy routine helps you survive the winter, but it is time to give yourself a little push in a new direction. Change doesn’t have to be dramatic; try a yoga teacher who is new to you, explore a new style of yoga or movement, make time for a long walk through a not-often visited area of your neighborhood. This card is also a reminder that creativity is supported by the mundane. If you want to be good at drawing, draw. Commitment is more powerful than inspiration. Keep steady through boring times, and you will find inspiration again. Balancing postures will help you remember what’s important by creating harmony and focus in your mind. The Five of Coins offers final advice, a naked woman wrapped in a thin cloth and a serpent. A frosty winter scene, this card also shows a glowing pink window with five illuminated coins. This woman has come to refuge, the Five of Coins suggests that support in a time of need will come from your community. The woman can also be seen as one who has refused the help of others and now suffers due to her own pride. Support from others can look like many things. If you see yourself as weak for accepting help you will only find yourself weaker. It is the generosity and support of those around you that makes you strong. Meditation will clear your mind to give you insight on who, what and when to reach out to others. Life is a balance, remember that you are needed as much as you need and be generous with your own help this month. We are all strongest together.